Global positioning satellite systems (GPS) allow us to travel more safely and more efficiently through areas totally unfamiliar to us. GPS systems that use touch screen technology as a user interface can become filthy and can harbor germs and bacteria. Whether integral to an automobile or as a hand-held device, touch screens need to be cleaned regularly for viewing enjoyment and for health reasons. Removal of soils from the surface of these devices greatly reduces the ability for germs and bacteria to thrive. You can use eScreen to keep your GPS touch screen looking new, clean, and bacteria-free. To see the best results, turn off the device when cleaning. The results will be startling. Hold the bottle about 6-8 inches from the screen, spray eScreen and allow it to sit a moment. 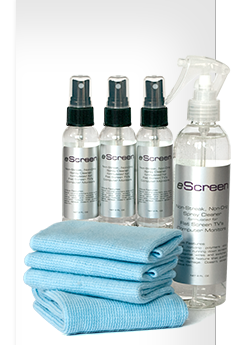 Because eScreen is a special non-drip formula it can be sprayed directly onto the screen surface. Gently wipe the surface starting at the bottom with a back-and-forth motion. As an added benefit, when cleaning the GPS system in your car, try eScreen on all the surfaces (mirrors, windows, dashboard, leather and leatherette, inlaid wood and plastic, plastic headlamp covers, etc.). eScreen has been tested and proven on all these surfaces and provides a shiny clean streak free result.